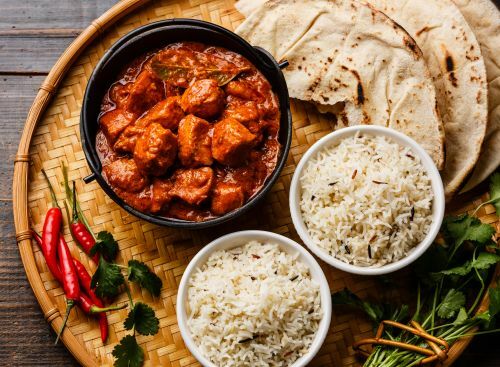 Menulog delivers for Raju's Indian Restaurant so you'll be able to track your courier on a map. Homemade pastries stuffed with spiced green peas and potatoes. Served with mint and tamarind sauce. Seasoned vegetables mixed with chickpeas, spiced batter and fried. Served with mint and tamarind sauce. Deep fried snack with vegetable stuffing. Crispy golden brown vegetable spring rolls with sauce. Crispy golden brown deep fried calamari rings served with sauce. Boneless chicken pieces cooked in tasty mango flavoured curry. Tender goat meat with bone cooked with special Raju's curry. Tender pieces of beef cooked with potato, onion and capsicum. Chicken tikka pieces cooked with onion, capsicum and tomato. Cottage cheese cubes cooked in butter creamy sauce. Seekh kebab cooked with onion, capsicum and tomatoes. Our most popular and healthy chicken dish, marinated in yoghurt with spices and herbs, cooked to perfection served with mint sauce and salad. A great combination of tandoori items served sizzling hot with sauce and salad. Tender pieces of boneless chicken, marinated in yoghurt with spices and herbs, cooked to perfection served with mint sauce and salad. Lightly spiced minced lamb rolls, cooked in tandoor on a skewer served with mint sauce and salad. Tender lamb cutlets marinated with spices, herbs and vinegar served sizzling hot, with mint sauce and salad. Tender chicken cooked in hot red chilli and vindaloo sauce in Goan style. Boneless chicken pieces, cooked in spicy gravy with tomatoes, onions and capsicums. Boneless chicken pieces cooked with spicy spinach gravy. Hot and spicy chicken cooked in South Indian style. Boneless chicken pieces cooked in mild cashew nuts and creamy gravy. Boneless chicken pieces cooked in Raju's specialty curry. Boneless chicken pieces cooked in tandoor and simmered delicately in rich tomatoes with cashew and creamy sauce. Traditional Kashmiri dish, tender pieces of lamb cooked in roasted spices. Tender pieces of lamb cooked to perfection in mild cashew and creamy curry sauce. Tender lamb cooked in hot red chili and vindaloo sauce in Goan style. Tender lamb pieces cooked in spicy hot spinach gravy. Tender lamb cooked with ginger, capsicum, tomatoes, onion and a dashed of lemon. Tender pieces of lamb cooked in South Indian style. Tender pieces of beef cooked in South Indian style flavoured with coconut and curry leaves. Tender beef cooked in red hot chilli and vindaloo sauce in Goan curry. Tender pieces of beef cooked in mild, rich creamy curry with dry fruits. Tender pieces of beef cooked in thick spicy curry with capsicum, onion and tomatoes. Fish fillet cooked with coconut milk, mustard seeds, fresh coriander and herbs. Juicy pieces of fish cooked in spices, fresh tomatoes, capsicum and onion. Prawn cooked with fresh tomatoes, capsicum, onion and flavoured with coconut and curry leaves. Prawns cooked in special vindaloo sauce. Prawn cooked in rich creamy cashew nuts and coconut sauce. Combination of lentils, tomatoes, cream cooked slowly and simmered to perfection. Eggplant cooked with onion, capsicum, tomato and potatoes. Fresh mixed seasonal vegetables cooked in Raju's special sauce. Cauliflower and potatoes cooked with fresh tomatoes and garnished with fresh coriander. Lentils cooked with spices, herbs and butter tadka with cumin seed. An assortment of fresh vegetables and dry fruits, cooked to perfection, with cashew nuts and creamy sauce. Grated cottage cheese, potatoes and dried fruits stuffed dumplings cooked in Raju's special sauce. Fresh spinach and fresh cottage paneer cooked with spices in a creamy sauce with the flavour of garlic. Fresh mushroom, fresh cottage cheese, tomatoes, capsicum and onion cooked together with spicy gravy. Pumpkin cooked with onion, capsicum and tomatoes. Basmati rice cooked with spicy vegetables. Chopped cucumber and tomatoes in yoghurt with light herbs and spices. Milk dumplings in traditional sweet syrup. Mango flavoured home made yoghurt drink. Plain flour bread brushed with butter. Naan bread brushed with garlic. Plain flour bread stuffed with spicy cottage cheese. Plain flour bread stuffed with dried fruits mince. Plain flour bread stuffed with spicy potatoes.